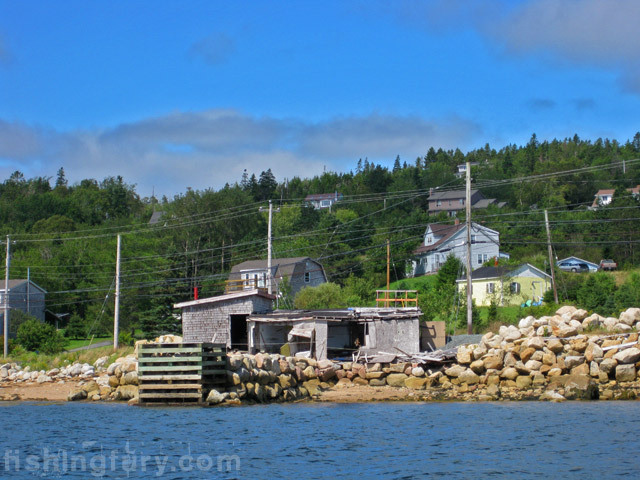 Fishing St. Margarets Bay, NS | FISHING FURY - A Fishing Blog with Attitude! I finally had the chance to do some saltwater fishing here in Nova Scotia. I met up with my buddy Craig who lives out on Black Point in St Margaret’s Bay around noon on Sunday. I’ve been listening to Craig talk about the bucket fulls of mackerel he’s been catching this summer, so I figured I should check it out before it gets too cold. 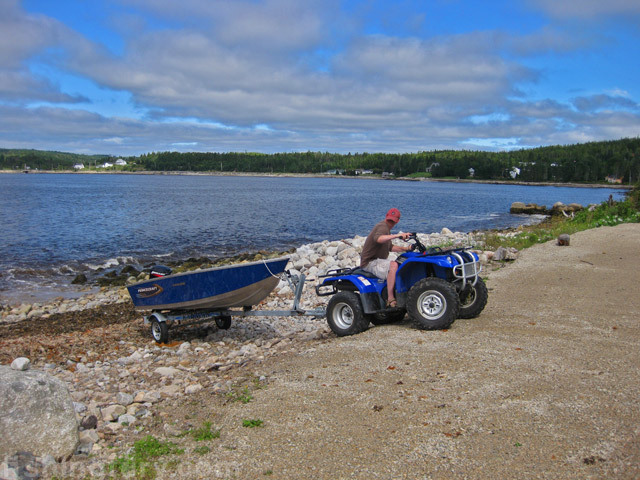 We launched from the shore of his uncles house and headed out toward deeper water. The map doesn’t really justify how massive the bay is, especially when you are sitting in a 14 foot aluminum boat. Craig didn’t waste any time, catching a small mackerel on the first cast, which was released after a few photos. 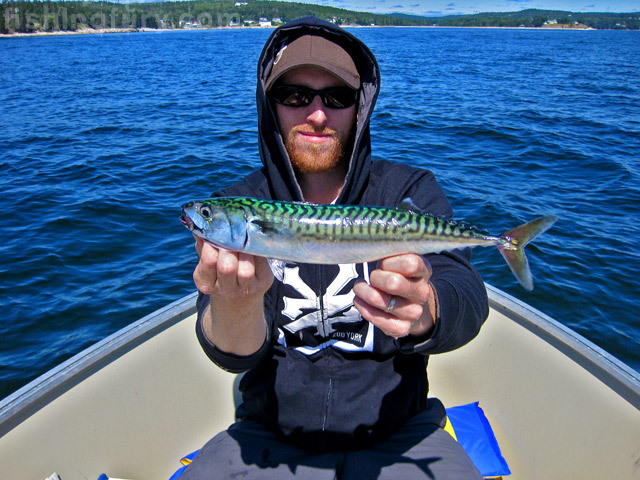 Its not uncommon to catch 3-4 mackerel at a time when you can find a big school of fish, but we really had a hard time finding them. We covered a lot of water drifting and then we headed out to fish around the small islands within the bay. We’d heard reports of mackerel being caught in the area yesterday, but as fate would have it, all the fish had moved on. It wasn’t until we were heading back to the launch that we came across some more fish. I thought I had snagged some sea weed, but it turned out to be three good size mackerel, at the same time, including the biggest of the day. Craig also caught a couple more fish before we motored back. It wasn’t the best day of fishing, but a great time was definitely had by all. I’ll definitely be heading out again as soon as I can. I love those little mackerels! hahaha yeah, next time we’ll leave earlier when there aren’t 3-4FT swells, and head farther out. Lots of Mackerel, Halibut, Haddock and I’ve been told King Mackerel out near the mouth of the bay, near Peggys Cove. Awesome photos I would expect nothing less from fishing fury. Excellent report and pics, the color on the little mackerel is gorgeous! awsome looking place, sounds like fun was had. If you fish a heavy weight on the end, you can put 5 hooks with feathers running down the line and just jig the line up and down, hey presto, 5 Fish on the end! What lures/baits/tactics were you guys using? They’re called Mackerel rigs here – just like the sabiki rigs I used to use to catch bait in the BVI, but with bigger hooks and strong line. I’ll take some photos when i get a chance. I’ve been out mackerell fishing with a friend but now I want to try something a bit bigger. I saw a post saying there are halibut and haddock out there but does anyone have any experiences of fishing deep water? Put a heavy mackerel jig on the end of six feathers and then troll along off shore about 300 ft. The goal is to catch seven at a time. Once one is hooked the flys flash for more. It works. The smaller mackerel are sweeter.